It's Lovely! I'll Take It! : So close. 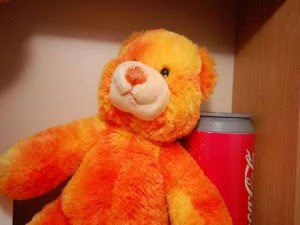 Orange teddy bear leaning against a fake soda can? Check. They love it so much it's in there twice!! It brightens the place up doncha think? It's clearly symbolic of the family you will have once you own this family friendly property. Obviously they can't put up pictures of their kids - the internet is a dangerous place. Wow!! Hilarious. Love that one. Definite selling point. I assume the bear comes with the house then? Wow look at the closet space! Woo Something I found in the blog... I feel so excited! It's a cry for help. Get me out of this pink room!!! They'll never find the money in there! It looks so much like a REAL Coke can, behind a REAL bear!